Today has been exceptional. 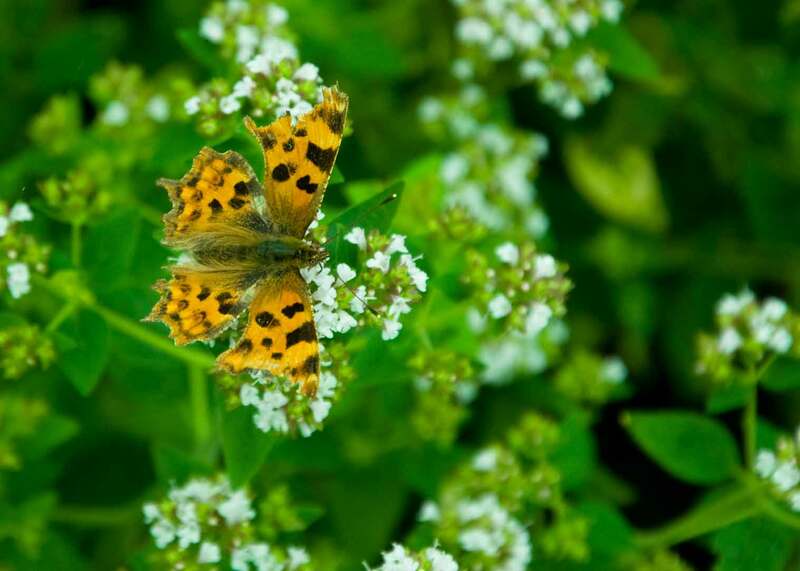 Walking back up the garden having sown more radish and beetroot, I disturbed the butterflies feeding. They swarmed in front of my eyes. Such a delightful sight! Most of them were peacocks, but I have spotted today small coppers, a common blue, red admirals and large and small cabbage whites. That’s just the butterflies. 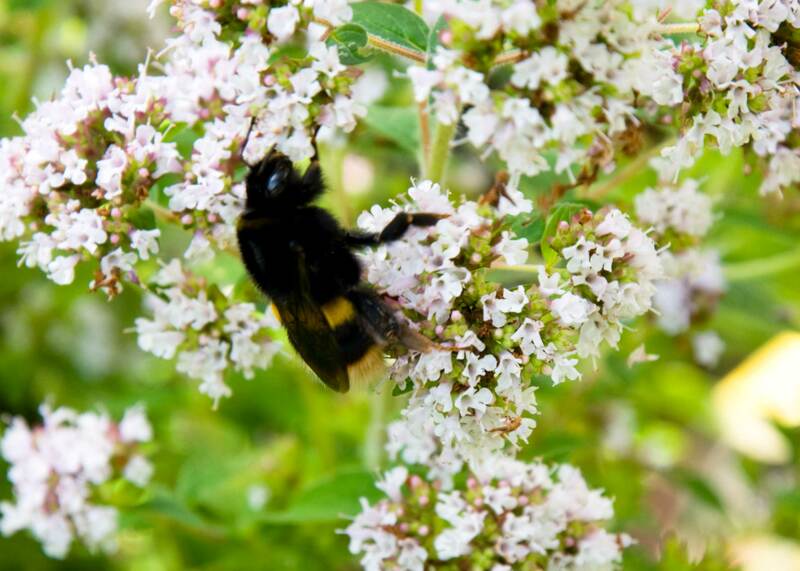 I noticed a couple of years ago when visiting Geoff Hamilton’s garden at Barnsdale Gardens that the marjoram had more bees on it than anything else. 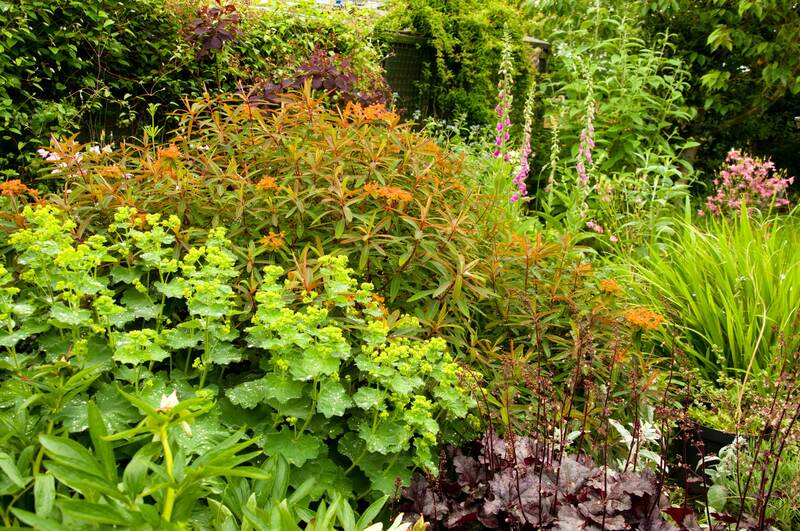 As this herb is one I make a lot of use of, I resolved to ensure at least one big clump adorned one of my borders. I have one marjoram and one oregano clump right nest to each other. This has paid huge dividends. Not only do I have plenty for my antifungal, antibacterial tea, but I have many, many bees of many types. Now, I’m no bee expert, but I saw working honey bees, buff tailed bumble bees, leaf cutter bees, white tailed bumble bees and lots of others. Hoverflies dodged their way around them, all feeding and buzzing to my delight. The maxim I keep repeating, ‘build it (or grow it) and they will come’ actually does pay off. There’s a big event happening. I’ll be getting involved myself. This is a cause that really matters. One third of our food needs pollination by insects, mostly bees. Peaches, runner beans, apples, pears, you name it, bees do the job for us. 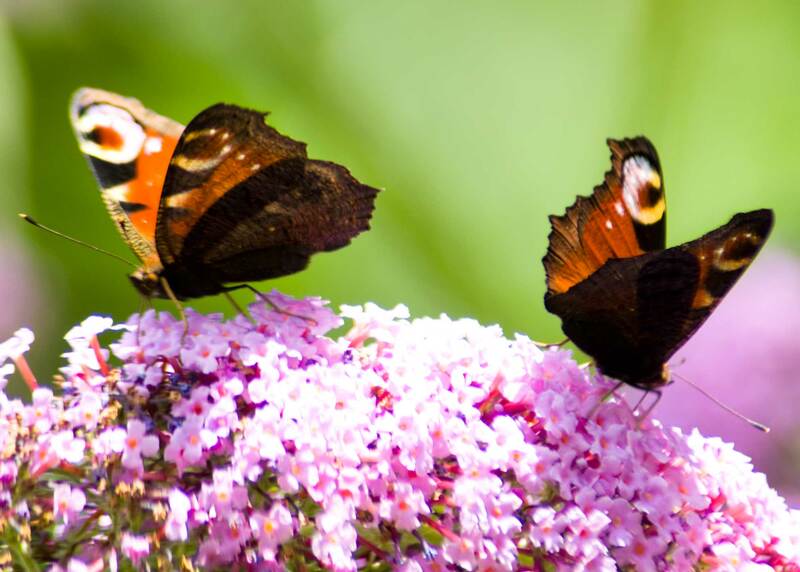 The Big Butterfly Count 1014 takes place from 19th July (so it’s happening folks) until Sunday, 10th August. Right now, you can help conservation by giving the scientists the information they need. Here’s the link to get you started. And you can plant marjoram, simple single flowers like these dahlias, Buddleja davidii to help our insect population. Our gardens are hugely important. They cover so much of our land that we can save these insects from their demise if we try. Sorry to rant, but they need our help and it’s such a simple, easy thing to do. Grow simple flowers! Grow herbs. Will you? Oh, I’ve had to come back and edit this post. My memory is tragically bad. I mentioned birds, didn’t I, in my title? That was to remind you. They need water. If you don’t have a pond, please put out a dish of water or a bird bath. They need to drink and bathe. Many have visited my bird bath today. They’re lovely to watch, so don’t miss out. Great Crested Newt. Once Common, Now Endangered. Well, I was chatting to my neighbour. Comparing gardens, I told him of my plans to install a wildlife pond this autumn. Guess what? 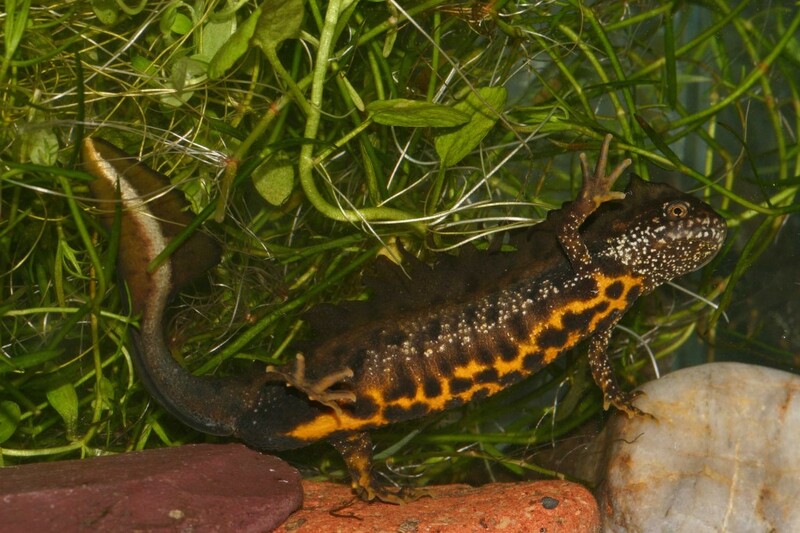 When he had a wildlife style pond he had great crested newts! So they are in the area. This may well be the best case of ‘build it and they will come’ I’ll have had so far. I certainly will build it. Of course the advantages of ponds are well known. Not only will I have a chance to help an endangered species, but all the other wildlife a pond will inevitably attract is going to increase the biodiversity of my garden and many others. As a child brought up in the north of England, before the days of Elf and safety, I played in the mill ponds that serviced the cotton industry. The mills, ponds and industry have gone, and so have the great crested newts that were then common and we played with. The ponds were steep-sided concrete affairs, but the newts didn’t seem to mind. Now they rely on us to make homes for them and leave them be to reproduce and hopefully recover their numbers. This is just as well. Our local council have approved planning permission for houses to be built on green fields behind us, and the farmer who owned them is quite happy to take the money and run. So anything I can do to make homes for the creatures that will be displaced can only help. We have a hedgehog house, a bat box, five nest boxes (and will install more) a log pile, long grass, wild flowers and a huge nectar bar in the form of my borders. They will get bigger as I continue to expand them and shrink the amount of lawn. I say lawn, it’s more like rough grass, and not my top priority. I’ve planted lots of climbers around the fencing, where native hedgerow isn’t. In the hedgerow, I’ve added more honeysuckle, and pushed in native flowering plants, hoping they’ll cope and get on with it. So far I’ve had success with one or two vetches, and leave bits of nettle, but don’t really need to. There’s lots of it around where we live, so I don’t have to get stung every time I’m tending the garden. I love this lifestyle. Food on the table and wildlife in the garden.It’s quite easy, this environmentally friendly gardening, once you know how. Much more relaxed than the old stiff, prune it to death style of gardening that saw every blade of grass regimentally organised and every flower standing to attention, bare soil in between. Give me abundance and flowers, insects and animals very time. Summer Rewards The Work Of Spring and Butterflies Where Are You? Spring is hard work in the garden. 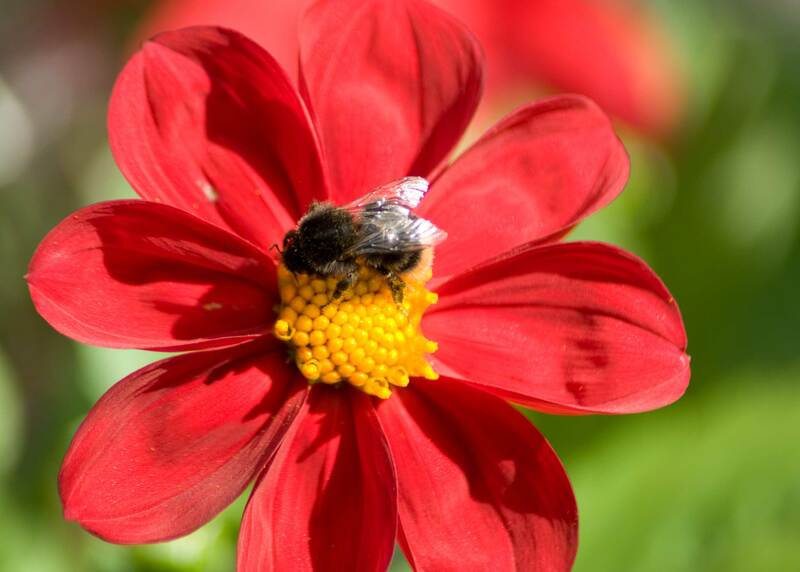 Digging, weeding, the preparation of vegetable beds and the propagation of flowers for those bees, birds, butterflies and other pollinating insects. 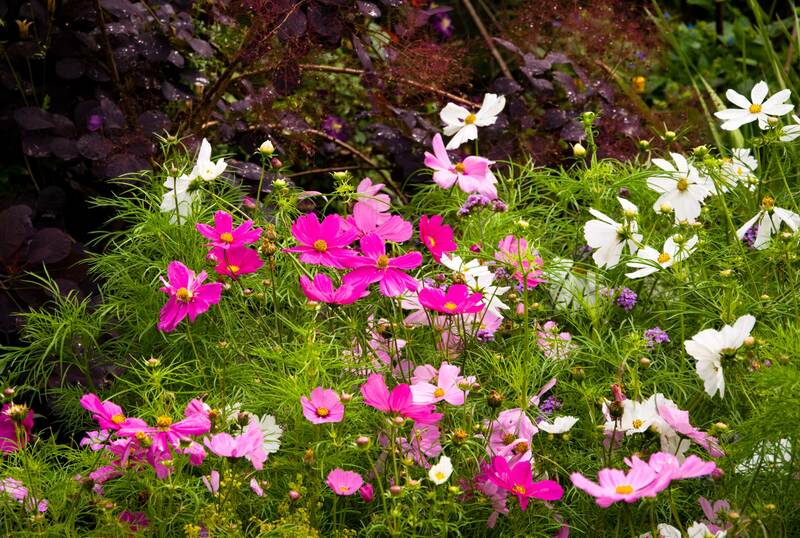 Summer brings the rewards, as well as the maintenance jobs and late summer sowings. We’re now eating lettuce, khol rabi, turnip, a bumper crop of new potatoes, strawberries, beans (runner and French) radish and leaf beet. Tomatoes are delicious and aubergines are forming in the greenhouse. Delightful! I’m now a little frustrated, as I tripped and fell flat on my face on a hard wooden floor a couple of days ago, and muscles and bruising now have to be rested and nursed better. So how I’m going to remove the foxgloves, dead head the ladies mantle and other plants that will seed everywhere I don’t know. I also want to sow more beetroot and spring onions. Despite all the stuff that seems to be growing well, spring onions aren’t. I don’t know why I’m having such trouble with them, as they are normally easy to grow, but this year I’m having to buy them in. Very few have germinated and grown. Maybe I need to change to another seed supplier for them, or grow them in a different spot. Wow, just went out to get some veg for lunch and realised what a great crop of Dwarf French beans we have. I’ve grown the climbing variety before but didn’t have room for the dwarf ones. They’re quite prolific and will definitely be on next year’s grow list, as they’re my partners favourite! Some you lose, but others you win. I’ve already got a small later crop sown in a container, so we should have even more to come. Using Painted Lady runner beans seems to have helped keep the pigeons at bay, too, so my runner crop has set much better than last year, with less nipped off pods. I’m glad pigeons aren’t more intelligent! Now the beans just need a little time to develop. They are MY favourite! I could eat a plateful at a time. The rest of the garden is great at the moment, with lots of flowers chosen to attract the insects, especially butterflies. So where are they? I have cosmos, buddleia, sedums and different daisies in flower now, but very few visiting butterflies. Even the verbena bonariensis has only attracted the odd small tortoishell. Disappointing and worrying. Are numbers really that low? Bees are here. I’ve even spotted a leaf cutter bee nesting in one of my alpine troughs, and I think is what is carving up my dahlia leaves, and hoverflies are here too. So please come, butterflies. There’s a whole snack bar waiting for you! 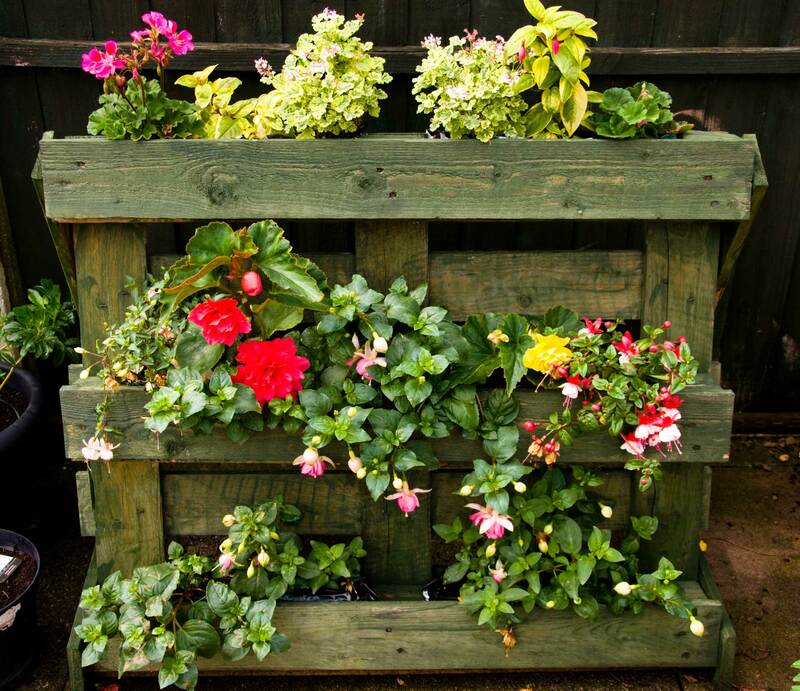 Our experiment with a pallet planters is a resounding success. We made one into a wall planter for alpine strawberries (better than opal fruits for a burst of flavour) and the other into a free standing planter for my precious flowers, mainly fuchsias. That stands against a fence which was bare and boring before, but not now. Re-cycling at its best! What a spring it’s been. Warmer than normal, and a high contrast to last year, when snow laid on the ground here until May. The garden has progressed greatly. We had an old ‘rockery’ neglected for the last ten years at least, and bound together by our native fern. It was a nightmare that took dedication and a lot of muscle to remove, but I now have about one and a half tons of gypsum rock to sell. That might pay for the path I want to lay down the 120’ length of the garden. Vegetable growing is now well underway. I have runner and French beans installed on their wigwams, new potatoes flowering in their rows and komatsuna, ruby chard beetroot, turnip and other veg coming along nicely. It’s so much better to nip outside and pick what we need than to get out the vehicle, go to the shops, buy stuff in plastic bags covered in whatever they decided it’s OK to wash them in and then have to pay for it, drag it home and unwrap it, dispose of the packaging, prepare and eat it. We bought some pork chops a while ago from a supermarket. I have, due to an auto-immune health problem, a lot of sensitivity to foods and chemicals. Plain old pork chops, I thought. A safe meal. I got ill after eating one. The symptoms felt like a reaction to gluten, normally found in grains such as wheat. We checked the packaging. THEY PUT GLUTEN IN PORK! The chops were adulterated with wheat, but still put in plain packaging so you think you’re just buying meat. Now I take glasses and a magnifying glass shopping and have to check EVERYTHING. So the more I can grow at home the better, though I can’t raise my own pigs! So, carry on planting. The food production will continue at this venue! But so will developing the rest of the garden, and my flower collection has increased hugely. I’ve sown seeds, bought young plants and propagated them, taken cuttings from friend’s gardens and treated myself to the odd little gem. 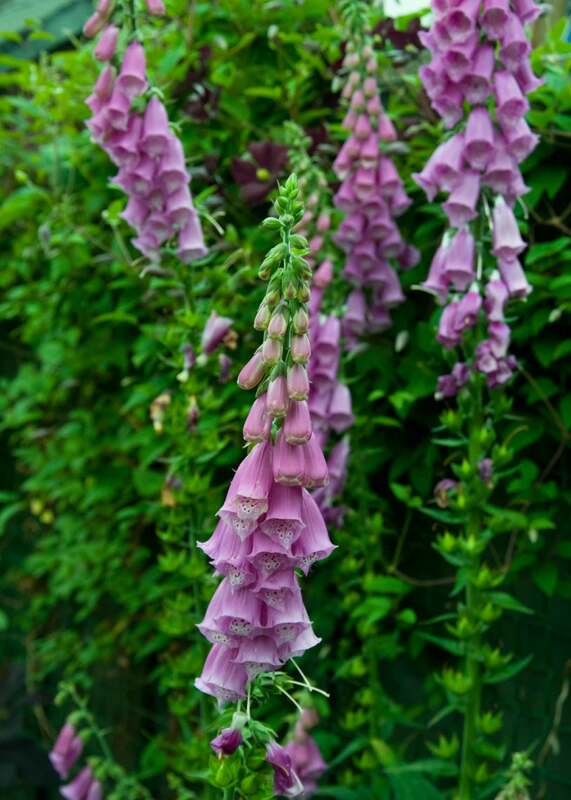 Then there are the self sown foxgloves, poached egg plants and columbines, which are just lovely at the moment. The rockery disaster is now a newly planted border and is beginning to look just fine. As for the house, decorating has slowed to a halt since the weather picked up. There are only so many hours in a day! But the conservatory looks good now, and is dripping with more plants. It served well in spring to start the tender stuff, and saved heating the greenhouse. Four varieties of tomato now grace the greenhouse border, and I’m trying aubergines for the first time. So far they look good. Fuchsias and geraniums abound! I bought some very cheaply last year from a charity event, and kept them over winter. Cuttings took readily and are now lined up in rows in the greenhouse. The front garden has had a makeover, new gravel and looks smart but a bit flat as it’s newly planted. Chimney pots are to be filled with fuchsias and trailing plants. Containers will contain more. Colour will light up the front to welcome us home. We live on a busy main road, though you wouldn’t know it when in the back garden. It’s also quite shaded for much of the day, so my shot of colour will lift it, and passers – by can enjoy my bargain plants. I hope to continue this blog, but please forgive my absence if I periodically disappear. My health is precarious and can prevent me from having a clear enough head to write. But I want to share my experiences, and pass on knowledge if I can , so I’ll try to keep posting. Here’s an idea for you. 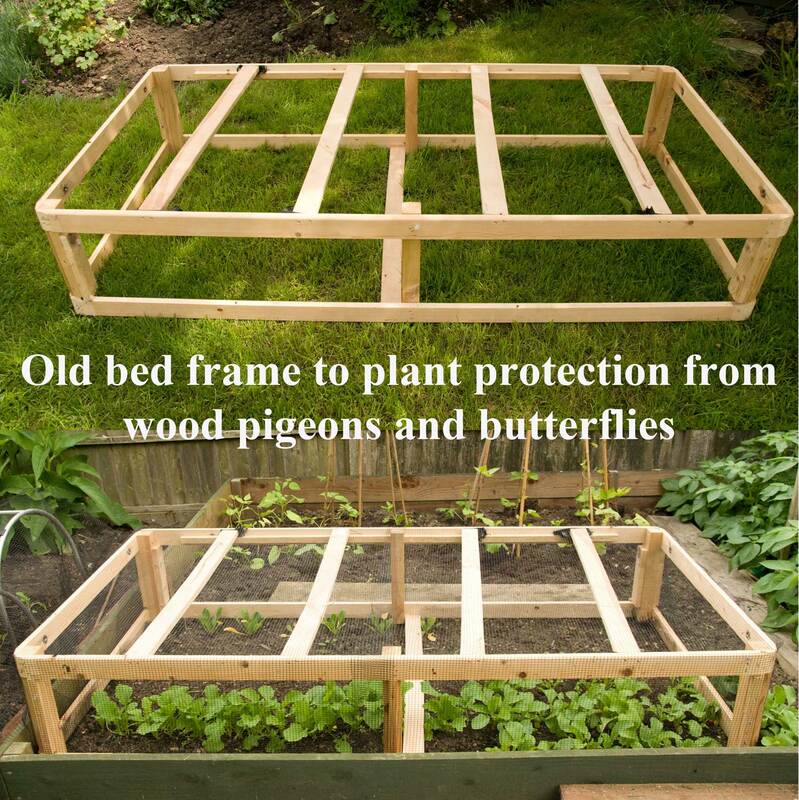 Re-cycling combined with desperation after last year’s Glut of cabbage white butterflies and demise of my crops, an old bed base was strip0ped and recovered-with butterfly netting. Now wood pigeons and cabbage whites can only LOOK at my well protected vegetables. I’m off now to sow more salads and some biennials for next year. Keep you posted. Yesterday I went into the garden at dusk. I was greeted by a sight I’ve never seen before. Moths. In their droves. They were drawn by the bergamot, a herb I planted for the bees and myself. It’s a beautifully scented flower used to flavour Earl Grey tea. 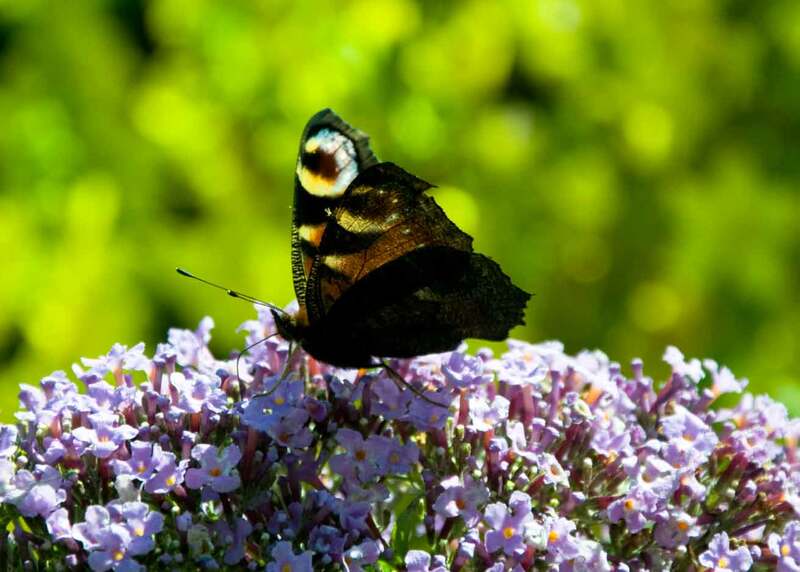 They don’t rest on the flowers like our daytime butterflies, but hover and feed on the wing. At least, those I could see were doing just that. I managed to get a photo using flash, but of course it’s not perfect, but does demonstrate their behavior nicely. You can actually see its proboscis delving into the flower for its pollen. I was overjoyed! All our insects are suffering drops in numbers, including our moths. 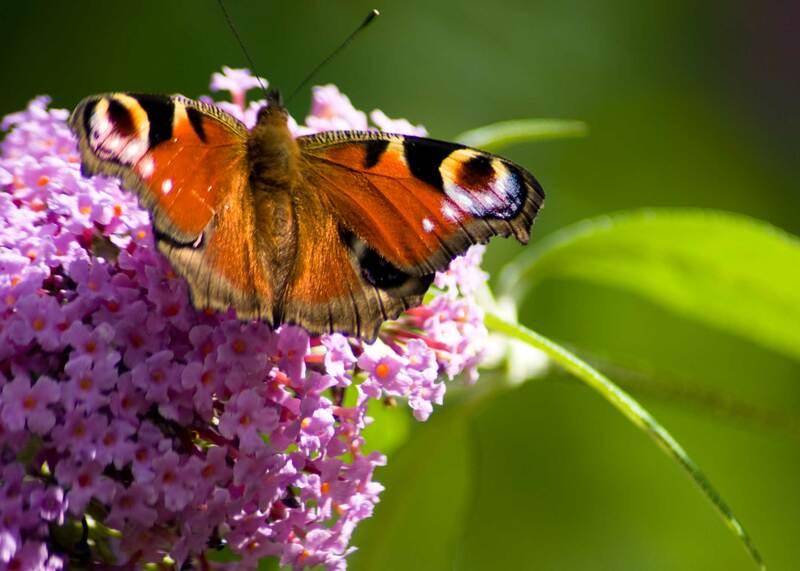 There is no difference between butterflies and moths, except their day/nighttime habits in this world, and they are pollinators of many flowers. 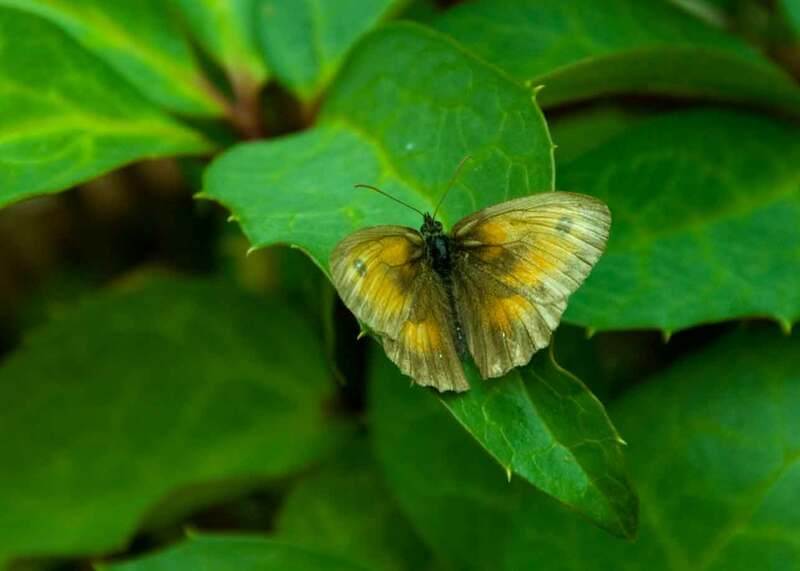 They are another part of our eco-system suffering habitat and food plant loss and need our conservation efforts as much as a daytime butterfly or bee. Once I’d spotted a species on the bergamot I started peering around to see of they were visiting any other flowers. Indeed they were. The buddlia was busy with them, as was the honeysuckle and dahlias. 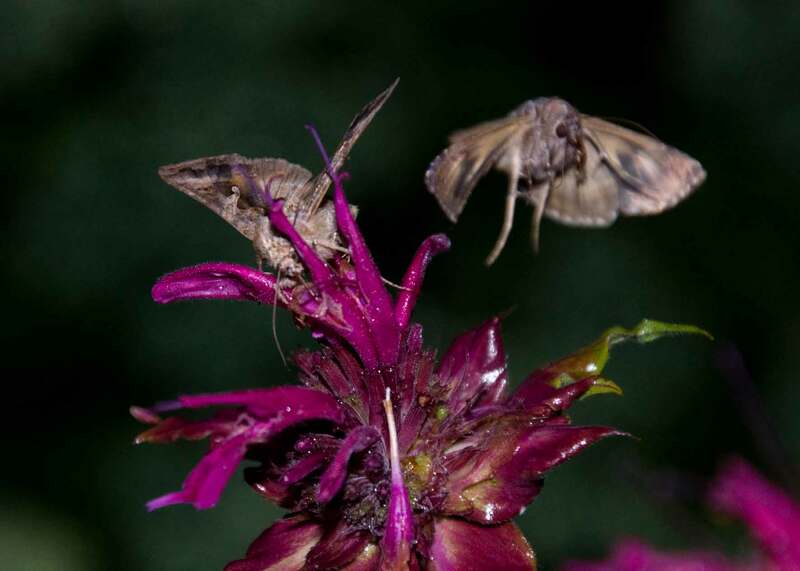 So when you feed the bees and the butterflies you are also keeping many moth species fed too. So many people have said to me that they love butterflies but hate moths. My reply is that to an entemologist there is no difference. They are all scaled, winged insects. Then I ask them if they’ve ever seen some of these beautiful creatures. 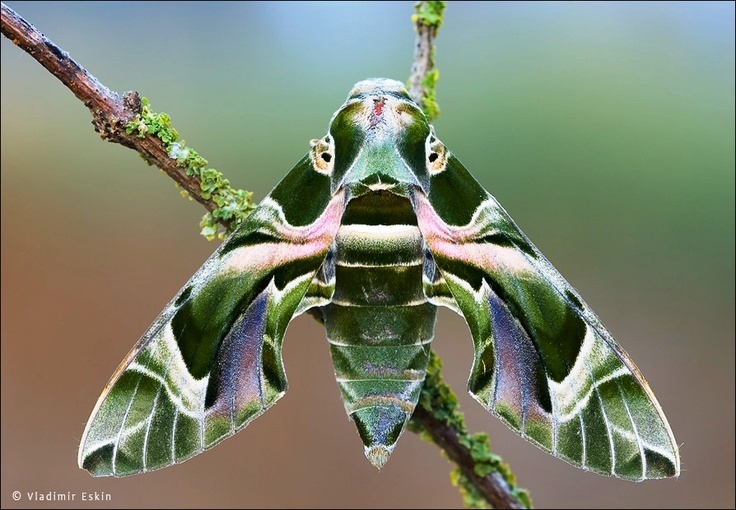 I have a book full of stunning photos of moths. Burnets have gorgeous markings.There’s one on the chart for the Big Butterfly Count and I’ve posted here a photo of another of our moths, just to give you an idea of how stunning they can be. And they deserve our support. Why not make space for some nectar rich flowers? I am delighted! The last year’s work to install in my garden plants for the butterflies and bees has been so worthwhile. Today I’ve noted many species of bumblebees, honeybees, comma butterflies, gatekeepers, green veined whites, small whites, peacocks and meadow browns. 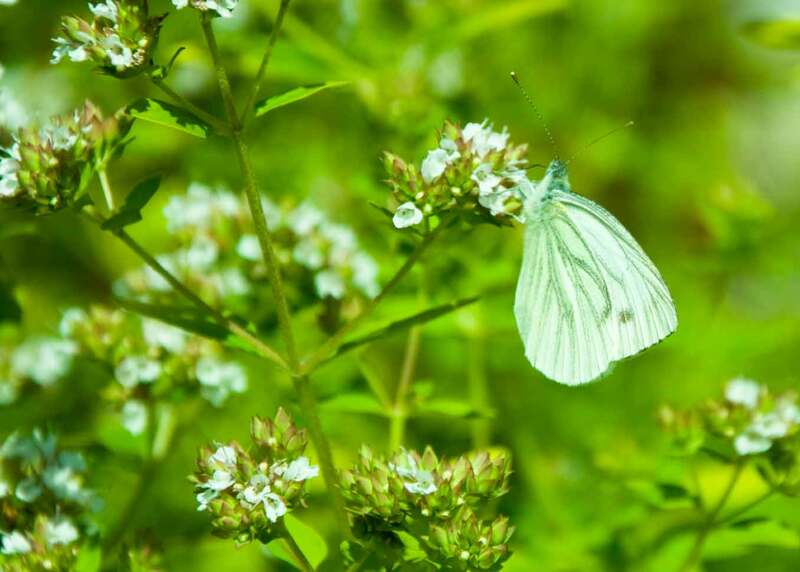 The marjoram is smothered in both bees and butterflies, and the buddleia of course in butterflies (the peacocks especially). Next year will be even better, as I’m busy making more plants to extend the flower beds and I’m saving seed or cuttings of every flower that’s nectar or food for them. I also intend to make bug houses and a bat box. For now I will of course be adding my sightings to the Big Butterfly Count so that better conservation can be achieved. Come on in wildlife! What are you doing to help wildlife? I’d love to know. And if you’ve any tips….please leave them for us all. This year’s biennials were very late to flower, but they’ve now set seed, which all thrifty gardeners will want to collect. 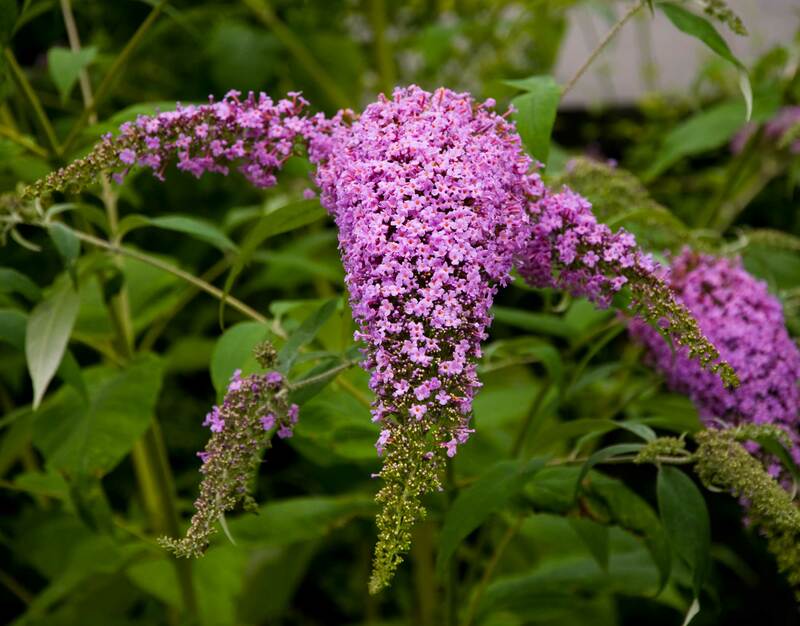 Of course, if your aquilegias or foxgloves were f1 hybrids, they won’t come from seed, but ordinary garden plants could produce some interesting seedlings. 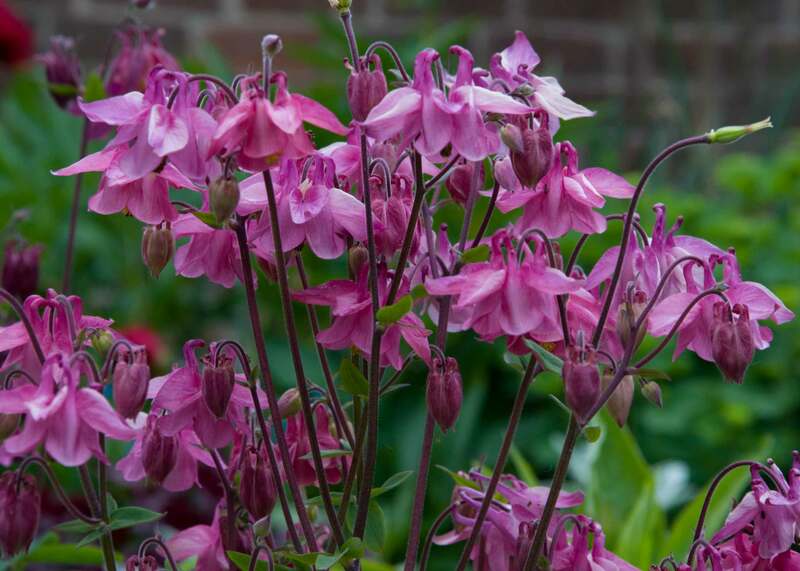 Many of the biennials in my garden are self-sown, including the stunning aquilegia in the photo above. 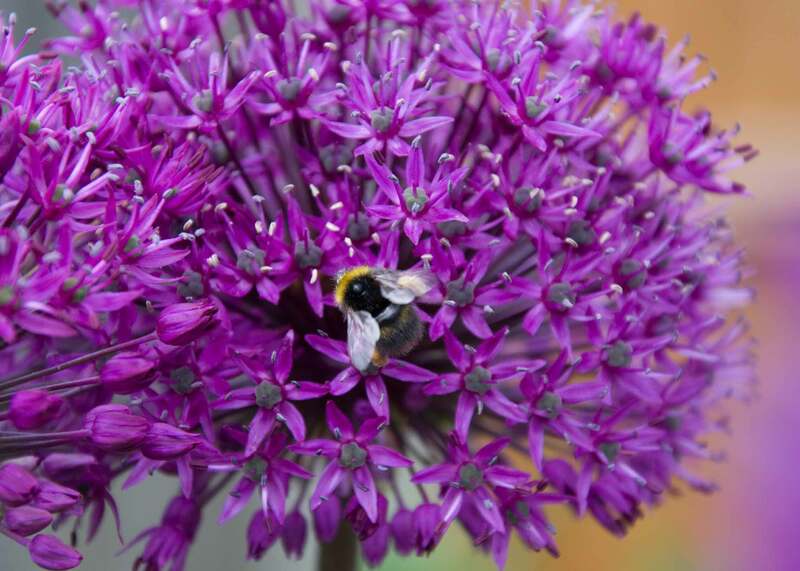 Allium Purple Sensation attended by grateful bee. So I am collecting what I can and sowing now for next spring. The bees and butterflies will love me for it, judging my the numbers of them feeding on the nectar this year. I’ve also collected seed of some allium purple sensation, which I planted last autumn and took pride of place in the border while in flower. I want more of them so have saved seed for sowing in spring. They may take two or three years to come into flower, but I’ll have raised them myself for nothing. That’s a pretty healthy budget!